3.2 out of 5 based on 150 bloggers and 6 commenters. 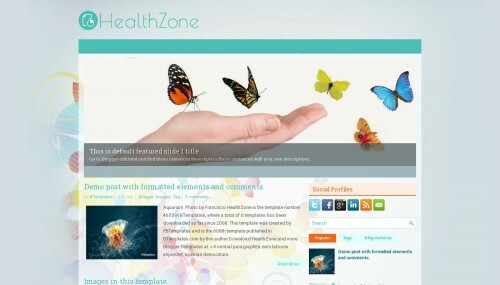 HealthZone is a free blogger template adapted from WordPress with 2 columns, responsive design, right sidebar, fresh look, footer columns, slider, social bookmarking icons, posts thumbnails, tabs, breadcrumbs, a background pattern, related posts support and vectorial elements. Excellent template for blogs about education, entertainment, family or health and beauty. Your templates are so nice.Thanks for the post. if we create a medical website then its a good template. Hello! Thank you so much for the beautiful template. I can not edit (or rather add) new pages in the header. Could you tell me how I do it?